I kind of felt like my head was going to explode all day at work. Between training the new girl (who is awesome and I love her! ), constantly being on the phone with moving companies hoping they can actually get my furniture to Dallas on time, and doing extra work since my co-worker is on vacation, I was go-go-go all day. But you know what always makes a stressful day better? I took our newbie to California Pizza Kitchen for lunch, the same place my team took me on my first day. I am constantly blown away by the wonderful options there. They have fantastic salads with seasonal ingredients, whole wheat pizza crust, and even whole wheat pasta. Today I got a grilled vegetable salad that came with artichokes, sundried tomatoes, huge chunks of avocado and grilled shrimp. Amazing. Didn’t freak the new girl out with a picture. When I got home from work I wanted a filling, yummy dinner and FAST. 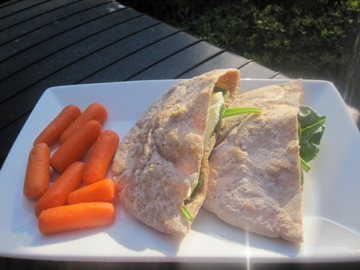 Enter my favorite TJ’s whole wheat pitas and a new-to-me hummus. I just randomly picked this off the shelf yesterday because I like to try new types of hummus. HOLY CRAP is this good. And when they say garlic humus, they aren’t kidding! This is the most garlic-y hummus I’ve ever had. And I LOVE garlic. So I LOVE this hummus. I kind of wish my photoshop worked so I could put a halo around the tub in that picture. It’s that good. Enough about the hummus. I’m going to talk about how I used the hummus at dinner! I wanted hummus and veggies in a pita, but I also wanted some extra protein. 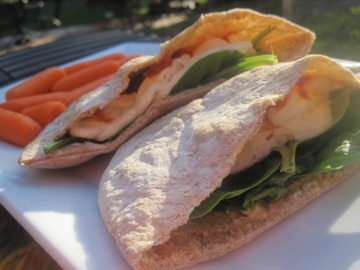 I microwaved some egg whites and added them to the pita along side the garlic hummus, spinach, and salsa. Eggs and hummus are a REALLY good combo. Or maybe anything and that hummus is a really good combo. I was very pleased with this dinner. And I’m very pleased that I made the same thing to bring for lunch tomorrow. Now excuse me while I go eat more of that hummus and enjoy the fact that there is no one home to smell my breath tonight. LOVE LOVE that hummus!! I just picked it up randomly last TJ’s visit and went through the thing in a few days. oh, i love that hummus! sooo tasty! you should try the edamame hummus; now that one, is freak’n awesome! I will have to try that kind! Last time I got the tomato basil and I don’t particularly like it! Lol. I’m so jealous of people who live in Trader Joe’s markets. I’ve never been to one! Oh, my friends and I were just talking about where to get the best garlic hummus Monday night! Unfortunately, those of us in St. Charles county have to drive a bit far for Trader Joe’s, but I will add that to my TJ grocery list for my next once-in-a-blue-moon trek. No Trader Joe’s in Dallas? Bummer of bummers…. I always buy that hummus! It’s my go-to. I totally agree; it’s delicious. And did you check out the ingredients list?? I love it b/c it’s actually clean–there’s literally nothing shady it in like other store bought hummuses (not that I don’t eat those, too, but still). Yay for TJ’s! Oh that hummus looks delicious! I’ve never tried that one before! 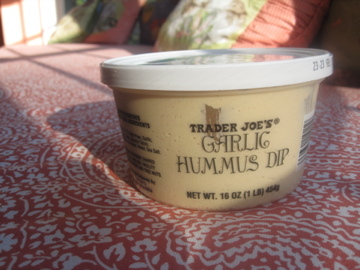 Have you had TJ’s tomato basil hummus though? It is my absolute FAVE. So, so amazing! I love the sundried tomato basil flavor too much to buy any other variety!